Is there anyone more whiny in the Transformers universe than Starscream? Every time you see the would-be leader of the decepticons he has something to grumble about. The question, then, is whether Transformers: Earth Wars give Starscream enough reasons to moan and complain until the fall of the Autobots? Thankfully, the answer is actually a confident no, as it takes a much beloved IP from and doesn’t milk the cash cow until it sings (unlike some of its mobile brethren). 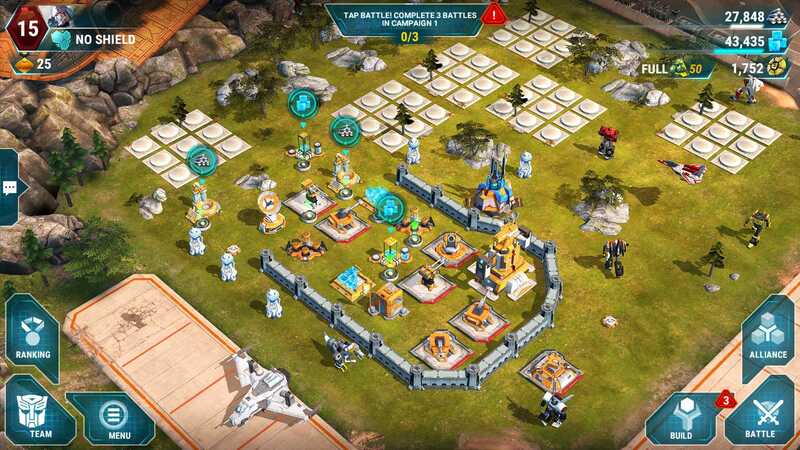 At its core, Earth Wars is a standard base building mobile game, with the chance to take part in a story mode about finding Cybertronian artifacts that will change the flow of the ongoing war. You are given the choice of fighting on either the Autobots or Decepticons side and from there it is your role to build your base including defences, production and increase the tally of Robots for you to command. As with similar games in the genre, building requires resource, and in Earth Wars these come in the form of of alloy and energon. You have to mine from the local environment, so you will set up refining buildings that will mine these for you every couple of minutes. Your transformers will wander about the base, changing to vehicle mode and back again and spouting out random phrases, depending on the outcome of the last battle. The models follow the style of the classic cartoon, so the retro-robot fan in me admittedly let out a little squeal of delight as they transformed with the authentic sounds. Other soundbites come from Megatron every time you collect Cyber coins, and they do add that little bit of shine to the overall package on offer here. Upgrading your buildings increases the volume you’ll produce per minute, but as with similar games, building and upgrading can take time. To get around this you have the chance to spend Cyber coins to finish the task straight away, or to pay for missing resources if you don’t have enough to pay for buildings. These coins can either be earned by completing tasks or you can buy them with cold hard cash. Now, I’ve sunk a reasonable amount of time into Earth Wars, and I can safely say so far that I’ve not had to worry about putting my hand into my cyber wallet in order to progress. The simple act of playing Earth Wars on a regular basis should ensure you unlock enough Cyber coins as you go, and it’s only a lack of patience that will push you in that direction. 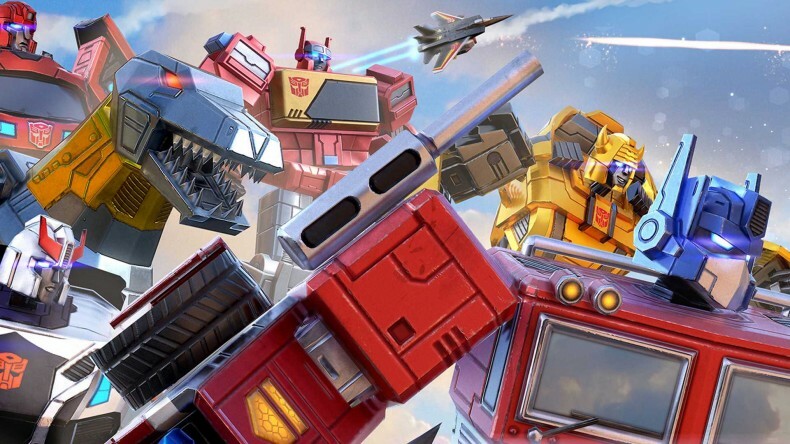 You’ll get coins for upgrading any of your buildings, or collecting certain levels of Energon, or upgrading your Transformers as they win battles. As someone who plays once or twice a day it works out well and there is always some activity to be getting on with, be that building or taking your little army to battle. Battles come in several flavours. You can either follow the storyline in the quest for the Cybertronian artifact and fight through predetermined scenarios, or go and invade another player. Both involve you picking a team of Transformers to take on the raiding party and each come with there own set of skills they can use in the heat of the conflict, and the aim is always to knock out the command centre and thus win the fight and you’ll come up against gun placements and opposing Transformers that will try to take you down. Victory rewards you the chance to level up and you can use research centres to further enhance your team. Those wanting to take things to the next level can join an alliance with other players to run smaller campaigns against other teams. Sitting behind it all you’ll find a database on the Transformers you’ve added to your team through regular crystal drops, and there are some very interesting developer diaries to take a look at as well. Honestly, I was a bit skeptical when I started playing Earth Wars with a primary concern that the franchise would be an excuse to push as many in-app purchases as possible. The gameplay is relatively casual, but it’s fun. The base graphics are serviceable and fit the theme, though some of the text on the screen can be difficult to make out. If you have the patience then you can’t really complain about a game of this quality that you can play for free. It all comes down to whether you are a fan of the base building genre. That said, even if you’re just a fan of Transformers, then Earth Wars is actually worth a download. No massive push to make you pay to progress. If you have the patience then you can't really complain about a game of this quality that you can play for free. Transformers Earth Wars is actually worth a download.